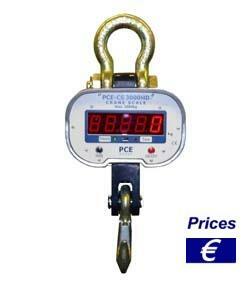 The PCE hook type scale is an advanced wireless crane scale. The crane scale combines the safety and comfort of having a remote, wireless control and a hook which allows simple usage. The PCE crane scale is especially suitable for harsh conditions in different industries, as well as for a wide variety of other applications. The crane scale has an internal mechanism to ensure that the received and indicated value is identical to the transmitted value. Under no circumstances will it indicate a different value than the transmitted one. This is an important safety feature. 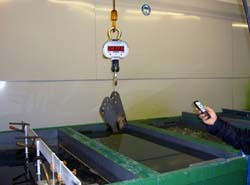 The wireless crane scale of small size won't need a lot of space. The crane scale is powered by internal rechargeable long life battery, which ensures a continuous work during 80 h before being recharged again. Maximum overload of 400% protects the load cell. The 30 mm LED Display shows the weighing data bright and clear at a distances up to 10 m. The affordable crane scale can be used by every practitioner in manufacturing and trading industry. If there are any questions about this crane scale PCE-CS HD 10000 HD, please have a look at the technical specification below or call: + 44 (0) 2380 98703 0. Our engineers and technicians will gladly advise you regarding the crane scales or any other products in terms of regulation and control, or scales and balances of PCE Instruments. Read the following instruction manual (crane scale instruction manual). 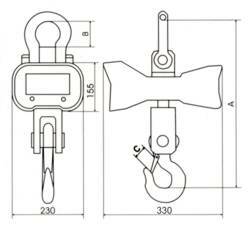 Another advantage of the crane scale is the sum-up function: isolated weights of successive weights are registered with a number corresponding to the sum of the gross mass of all the weighing tasks which can be recovered lately on a display. The use of the crane scale in a galvanized coating is shown in the adjoining image. The calibration procedure includes laboratory calibration process and ISO certification. The customer's name and address are included. These certificates are comparable to NIST and UKAS certificates. They are accepted all over the world.